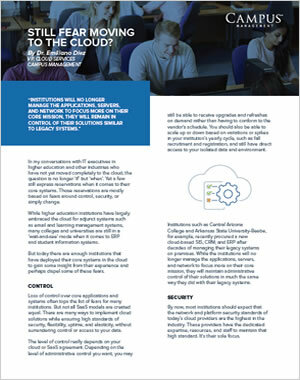 When it comes to migrating core systems to the cloud, fears around control, security, or simply change continue to linger across industries, including higher education. How do you as a higher education professional separate fact from fiction? In this article Campus Management’s VP of Cloud Services, Emiliano Diez, sheds light on these concerns and offers some advice for making the move to the cloud.